NATURAL HABITAT AND PREFERRED SITE: Many of the various crabapple species will do well in a wide range of soils. Malus ioensis is the prairie or Blanco crabapple which is a native Texan. Most of the crabapples on the market are introduced hybrids. Malus floribunda is one of the most common and easiest to grow across the state. Crabapple will grow in a range of soil from sandy to clay but needs well-drained soil in every case to avoid cotton root rot and other root diseases. IDENTIFICATION INFORMATION: Crabapple is a wide spreading ornamental tree with dramatic flowers in the spring, small fruit called crabapples and fall color that ranges from yellow to red. FLOWERS AND FRUIT: Dramatic spring flowers in various colors including white red and pink. The fruit is ½ inch in diameter maturing in the fall. BARK: Smooth when young and ranges from reddish brown to gray. Fissures and deep ridges develop on older trees. FOLIAGE: Leaves are simple, alternate and deciduous. Fall color ranges from yellow to red. CULTURE: Crabapple is easy to grow in any well-drained soil requiring only moderate amounts of moisture and fertilizer. PROBLEMS: Aphids, scale, spider mites, webworms, rust, apple scab, fireblight, borers and cotton root rot. It is also a fairly short lived tree. All of these problems can be kept to a minimum with the use of the organic program. Sick trees can be revived with the Sick Tree Treatment. 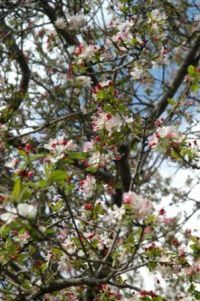 PROPAGATION: Done from cuttings for the plant to come true but crabapples can be grown very easily from the seed, although the resulting plant might be a great surprise. The native crabapple fruit can be collected in the fall when the pulp has turned fleshly but before it has fallen from the trees. Clean the seed before sowing or storage to avoid fermentation. Seeds to be planted immediately do not need to be dried but they do need to be dried for storage. Seed can be sown in the spring after being stratified at 41 degrees over the winter. Seedlings will benefit from light shade the first season. All crabapples will root from suckers and soft wood cuttings in the growing season or in February. INSIGHT: Native crabapples are in the genus Pyrus and are much more adapted to alkaline and drier soils. The native crabapples produce yellowish green apples about one inch in diameter and ripen in the fall. They are sour to eat but make excellent jelly, cider and vinegar. Pyrus ioensis grows in Blanco, Kerr, and Kendal Counties. Pyrus angustifolia grows only in the southeastern part of the state. According to Delena Tull’s book Edible and Useful Plants of Texas and the Southwest the seed and leaves of crabapples are toxic. Also check Texas Gardening - the Natural Way for more information.